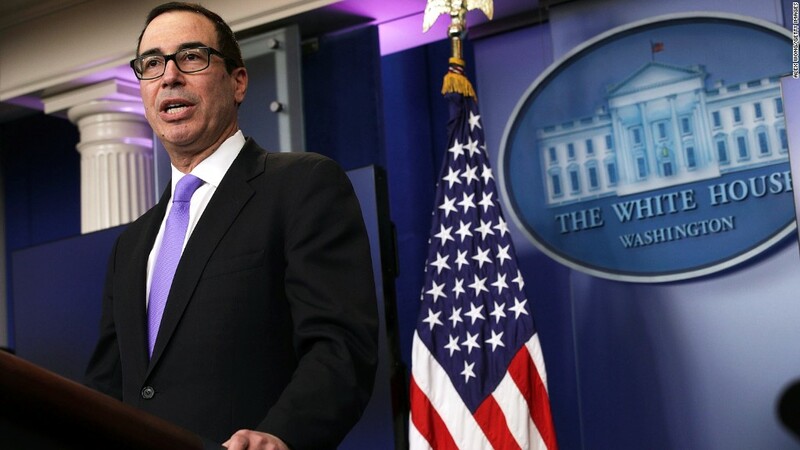 A cheeky plug for "The Lego Batman Movie" could land Treasury Secretary Steven Mnuchin in hot water. A Democratic lawmaker says Mnuchin might have violated government ethics rules last Friday when he mentioned the movie, which his company produced, during an interview with news site Axios. Mnuchin, who was formerly a Hollywood producer, made the remark when he was asked by a reporter for a movie recommendation. Before he answered the question, Mnuchin appeared to acknowledge the fact that federal ethics rules prohibit executive branch employees from endorsing products. "I'm not allowed to promote anything that I'm involved in," Mnuchin said. "So I just want to have the legal disclosure, you've asked me the question, and I am not promoting any product. But you should send all your kids to 'Lego Batman'." Senator Ron Wyden, the top Democrat on the Senate Finance Committee, asked the Office of Government Ethics on Monday to review Mnuchin's comments. Wyden said the remarks showed a "blatant disregard and disrespect to the office he serves." Mnuchin was an executive producer on the movie, which is a spinoff of 2014's "The Lego Movie." His company, RatPac-Dune Entertainment, financed the film. Mnuchin said he would divest his interests in the company within four months of being confirmed by the Senate, according to his ethics agreement. In the meantime, he pledged that he would not knowingly participate in anything that would effect the company's "financial interests" until he has sold his share. Wyden said in a letter to the ethics office that the public needs to know if Mnuchin is "using the government to increase his own bottom line." The ethics office works with executive branch officials to avoid conflicts of interest and can recommend penalties, though it has no enforcement power. In a statement, a Treasury Department spokesman said, "It was a light-hearted moment and comment. Secretary Mnuchin directly acknowledged and understood the ethics law involved." This isn't the first time a member of President Trump's administration has sparked ethics concerns. In February, top aide Kellyanne Conway came under fire for plugging Ivanka Trump's products in a TV interview. The ethics office recommended that the White House discipline Conway, but Trump's team concluded that she was speaking "in a light, off-hand manner while attempting to stand up for a person she believed had been unfairly treated."